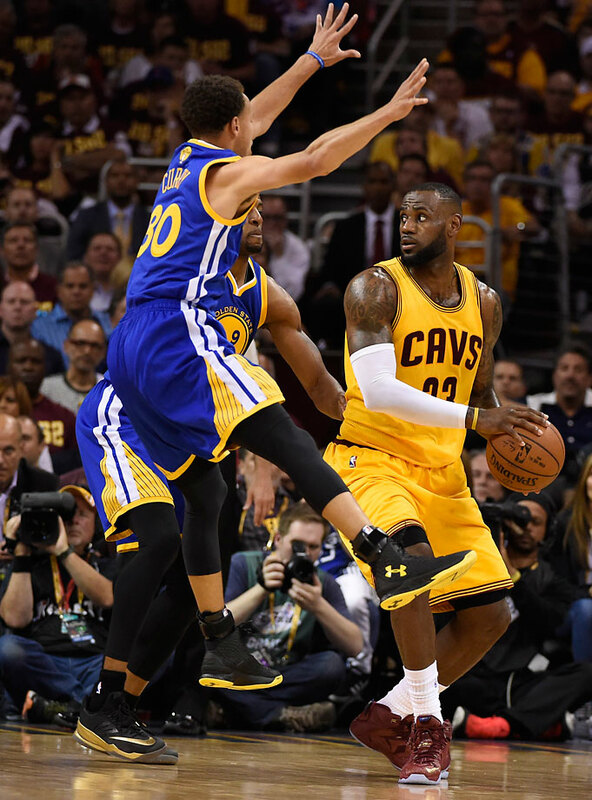 LeBron James and the Cleveland Cavaliers will look to bounce back from a 21-point loss when they face Stephen Curry and the Golden State Warriors in Game 5 of the Finals on Sunday. OAKLAND, Calif.—The Cavaliers face a fundamental problem as they enter Game 5 against the Warriors on Sunday: they're trying to "get back" into an NBA Finals that might no longer exist. 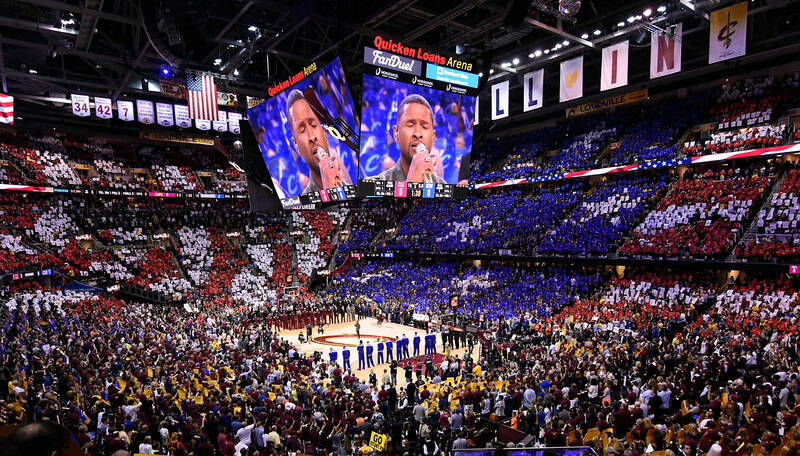 Everything was going beautifully, from Cleveland's perspective, for three games: LeBron James was dominating the Cavaliers' offense and controlling the game's pace, the Cavaliers' team defensive effort was excellent and they were bottling up a potent Warriors attack, and a seven-man rotation (following the loss of Kyrie Irving in Game 1) was holding things together well enough against a deeper opponent. All of those dynamics shifted radically during Golden State's blowout victory in Game 4 on Thursday, and they have threatened to shift for good. Steve Kerr's decision to go small by replacing Andrew Bogut with Andre Iguodala swung the pace to the Warriors' favor, it opened up gobs of space for Golden State's five-out lineup, it forced a crucial mismatch involving Cavaliers center Timofey Mozgov, and it eventually left Cleveland so exhausted that Cavaliers coach David Blatt openly admitted fatigue played a role in the loss and James copped to feeling "gassed out" after three quarters. Although Kerr wouldn't reveal his Game 5 starting lineup—joking that the media shouldn't trust him if he did after he "lied" about his Game 4—there seems little question that he will stick with what worked in Game 4. Meanwhile, James told reporters Saturday that Cleveland would stick with its makeshift starting five of Matthew Dellavedova, Iman Shumpert, James, Tristan Thompson and Timofey Mozgov. "We're going to play our game," James said. "We've gotten to this point by playing the way we play, and we're not going to change. We'll make adjustments throughout the game, but we won't change our starting lineup." Blatt offered a similar message, noting that Cleveland was "pretty good" executing its game plan in "three out of the four games" and that overreacting to Game 4 would be a mistake. "We've got to continue to do certain things really well," Blatt said, adding later that he didn't want to "give away too much" of his approach. "What we need to change, we will." Here's a look at three key factors for the Cavaliers as they weigh possible adjustments and seek to regain control of the Finals in Game 5. Blatt doesn't necessarily need to overreact to Golden State's success with its five-out look by going super-small himself, but he does need to be ready to react if the Warriors find early success with the same approach. Staying within striking distance is absolutely crucial for the Cavaliers, as it allows them to play their slow-down style on offense without trying to dig out of a hole. It's just fine for Cleveland to stick with its two-big approach with Mozgov and Thompson, but if Golden State gets hot early, or if it threatens to run away with things, Blatt will need to adjust and not look back. When the Cavaliers go big against the smaller Warriors, they will first need to hope that Harrison Barnes (4-of-9 from the field and 2-of-5 on threes in Game 4) and Andre Iguodala (8-of-15 overall and 4-of-9 on threes in Game 4) aren't shooting as well. The defensive mismatches posed by Mozgov's presence are not nearly as big of a deal if one of those two players is struggling or hesitant to shoot. Second, Cleveland must get back in transition defense, as leak out dunks by Iguodala and other early scores off made baskets are death to a bigger squad. Third, the Cavaliers should consider daring Draymond Green to shoot from outside even more than they have to this point: he's just 2 of 11 on threes during the Finals, and his confidence is running sky-high after a strong all-around Game 4. If Green takes and misses a number of threes, Cleveland would theoretically have a chance to get the game back to its pace by ending Golden State possessions early with its rebounding advantage. On the other end, James must punish Golden State's smaller lineups inside, directing traffic from the post and attacking the basket hard with the goal of scoring and drawing fouls. 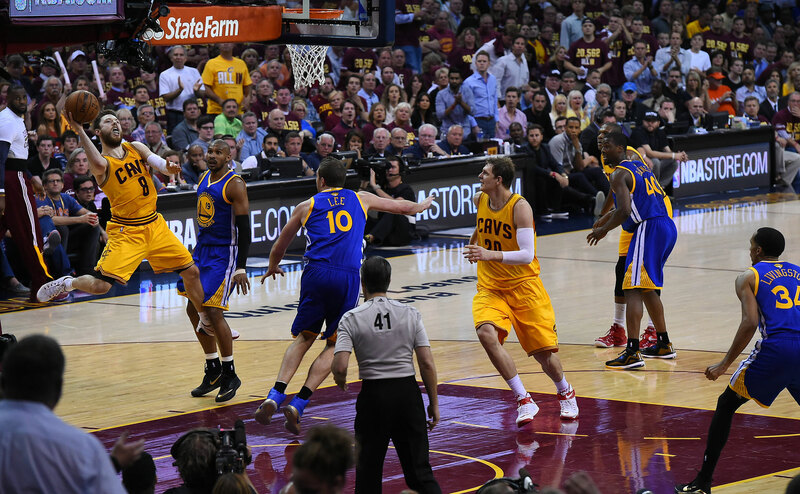 Foul trouble for Green or Iguodala would short-circuit a lot of the success Golden State has found going small. James must also put his jumper on ice: he was 1-for-11 outside the paint in Game 4, and those numbers absolutely should not be repeated if Golden State remains small. 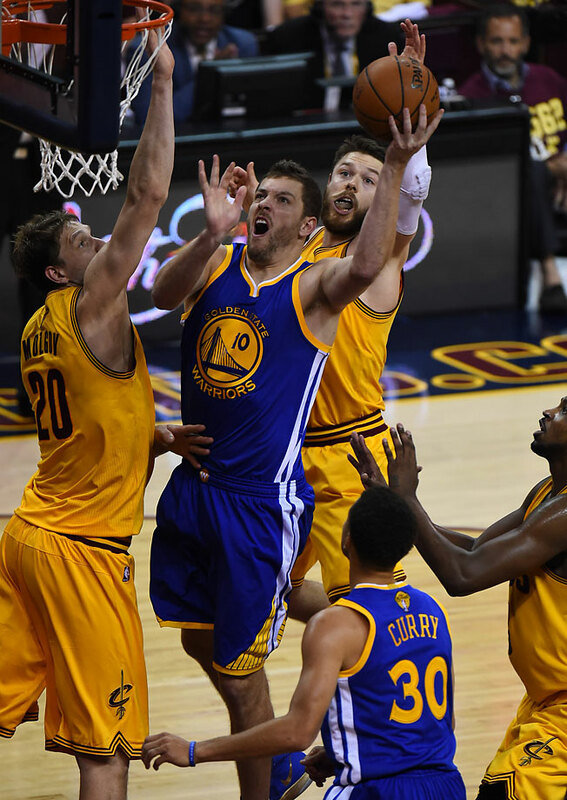 Mozgov, who scored a career-high 28 points in Game 4, must remain heavily involved, as the Warriors' five-out lineups clearly lack someone with the requisite length to deny him at the rim. 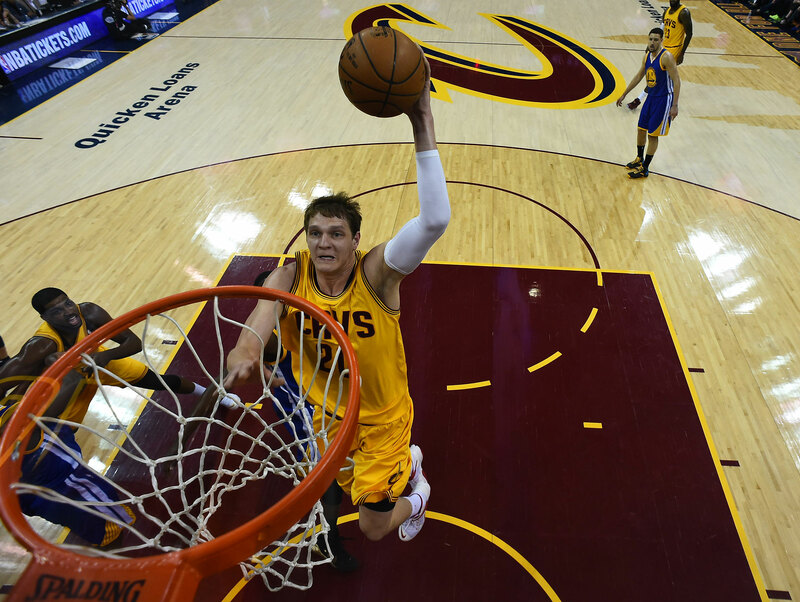 A successful James/Mozgov two-man game should open up more opportunities for Cleveland's spot-up shooters. Let's say, however, that Golden State's small lineups continue to run rampant. Then what? Blatt will need to replace Mozgov with a shooter, playing Dellavedova/Shumpert/Smith/James/Thompson or Shumpert/Smith/James Jones/James/Thompson. (It's trickier to use Mozgov instead of Thompson as the solo big because Thompson is so important to Cleveland's defensive coverage of Stephen Curry.) Mike Miller, who has mostly been benched since Game 1 of the East semifinals, is also an option in smaller lineups, but Blatt's hesitance to use Miller is understandable given that he was run off the court by Bulls forward Mike Dunleavy. Golden State's wings would likely be licking their chops if Miller sees real run. The other rotation-ending options—Shawn Marion, Kendrick Perkins—are probably not worth considering, given that the former lacks the ability to spread the court and the latter has no chance of keeping up in a fast-paced game. 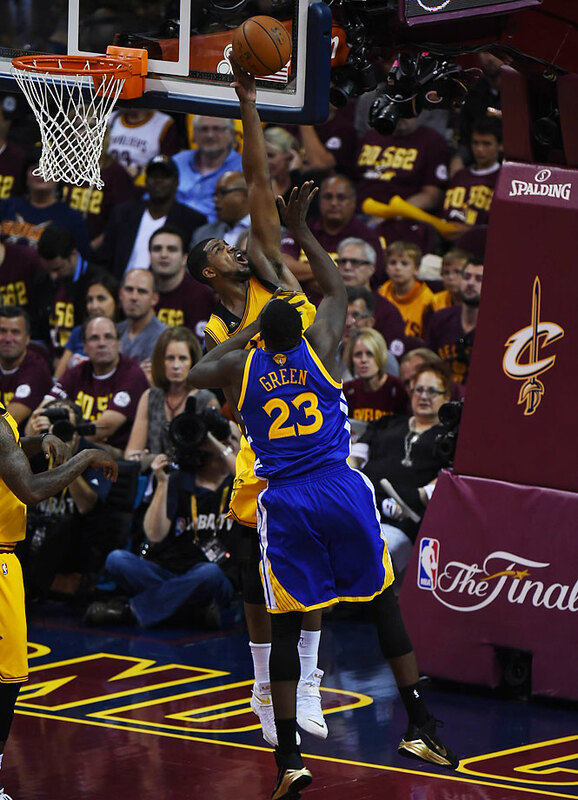 When Cleveland goes small, it must continue to over-emphasize an inside-out approach, seeking potential foul trouble for Green and/or Iguodala as well as high-percentage looks at the rim against Bogut-less defenses and second-chance points against an overmatched Warriors frontline. The harsh truth is that the Cavaliers might be able to find success as laid out above and still struggle to keep up with the Warriors' attack. 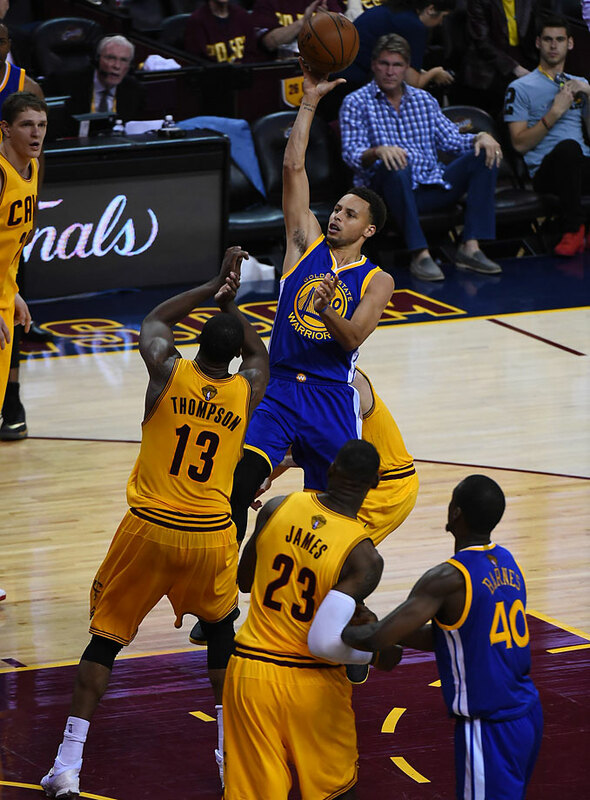 Game 4 was the first time Golden State really looked like Golden State in the Finals, and the result was a 21-point win. Honestly, Game 4 wasn't even a solid "A" effort offensively from the Warriors, who got "only" 31 combined points from Curry and Klay Thompson. Cleveland couldn't keep up with Golden State in fifth gear, and it doesn't have much hope if the Warriors find a way to reach sixth. 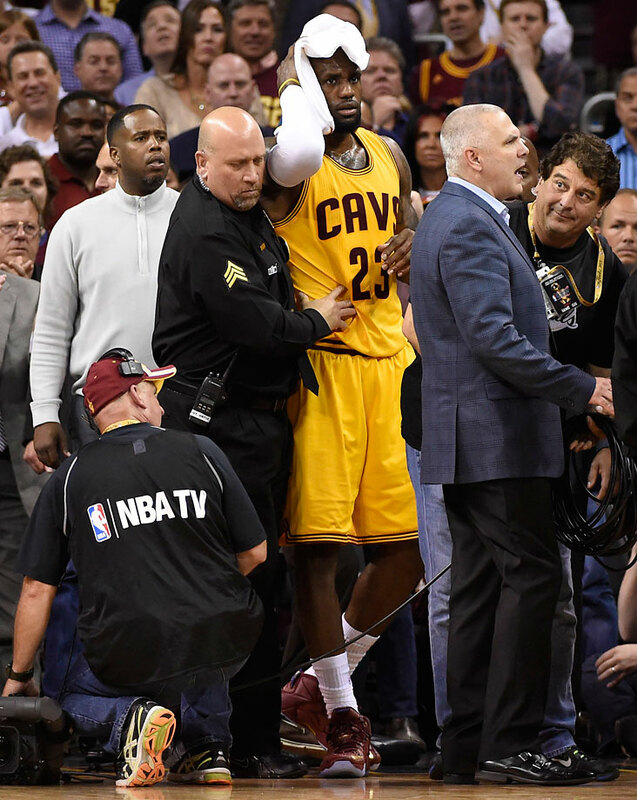 Do LeBron, Cavaliers have enough left in the tank to survive the NBA Finals? Assuming the Warriors' attack is good but not great, the Cavaliers will need to conjure up some perimeter production if they want to keep pace. Clearly, "make shots" isn't a rocket scientist's suggestion, but the depths of Cleveland's shooting woes make it a necessary one. Here's a look at Cleveland's cumulative shot chart through four games of the Finals, one that would inspire envy from both card-carrying communists and fire hydrants. 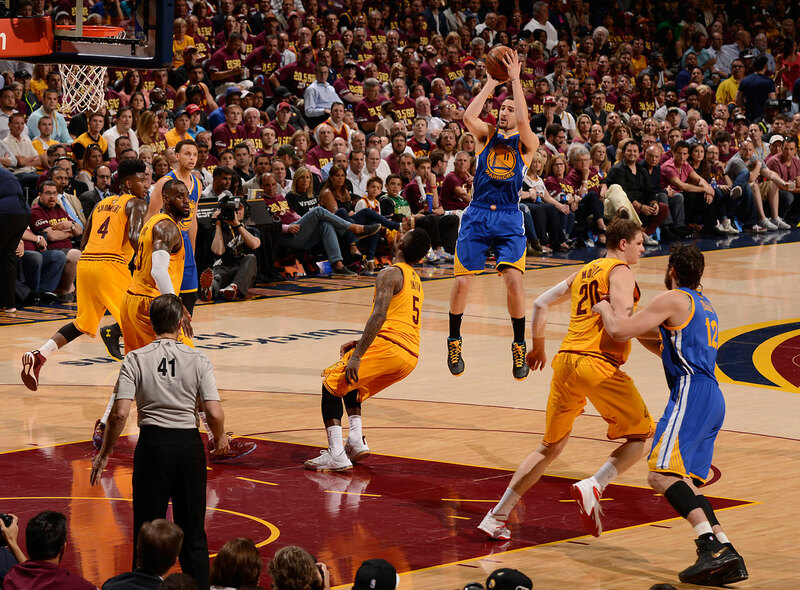 Much credit is due to the Warriors' defense, without a doubt, as they rank No. 2 in opponent percentage on corner threes and No. 4 in opponent percentage on above-the-break threes during the playoffs, per NBA.com. Golden State's very selective double-teaming of James early in the series allowed it to stay home and contest shots by Dellavedova, Smith and Shumpert, a strategy that has clearly paid off pretty well. 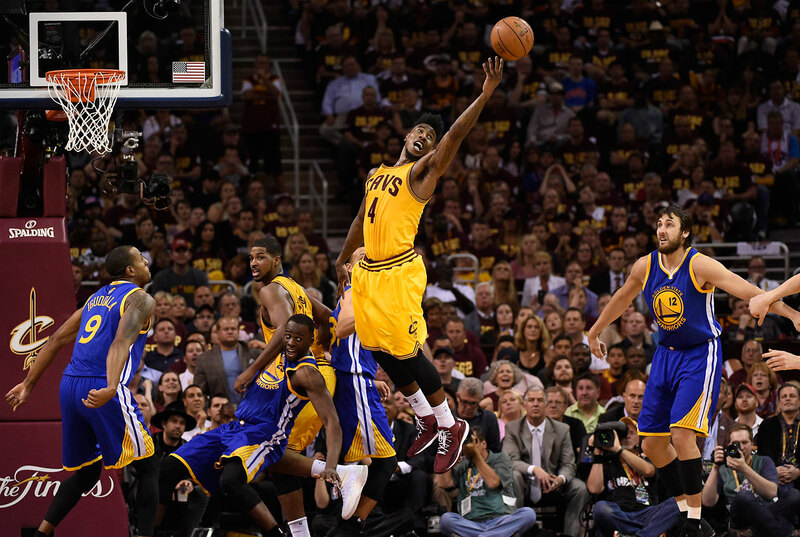 When the Warriors sent more help at James in Game 4, none of the Cavaliers' shooters stepped up in response. This series has reached the point where Cleveland's shooters need to make their collective presence felt or the Cavaliers will face the consequences. 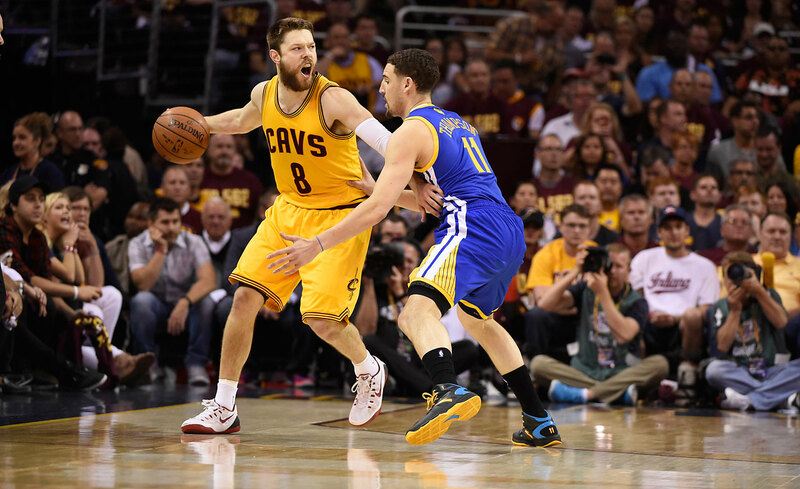 Dellavedova proved the impact a second perimeter scoring threat can have in the Cavaliers' Game 3 win, and Blatt would love nothing better than Smith and Shumpert to step up and take a turn. The Cavaliers' 4-for-27 outside shooting in Game 4 is simply too big of a mountain for James to overcome. On that note, Smith, in particular, has been a downright mess in the Finals. Unlike Shumpert, who injured his shoulder in Game 3 and has never been regarded as a true scoring threat, Smith really has no excuse for his self-described "horses---" play. During the Finals, the streaky Smith is shooting 29.8% overall and 25% from deep, and he was 0 of 8 in Game 4 from outside after making the wrong kind of headlines by riding a Segway-like scooter to the game. 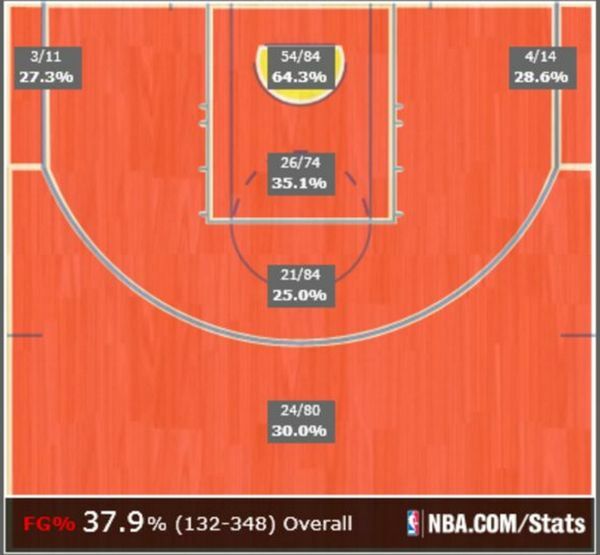 Throw in Smith's hideous use of his fouls and his inability to make an impact as a playmaker or rebounder, and his overall impact looks even worse than his blood-red shot charts suggest. "I don't care how many shots he missed," James said Saturday. "I don't want his head to be down like it was in Game 4. ... He can miss 100 shots [and] if they're great looks, they're drive-and-kicks, you shoot them with confidence. If he's feeling confident about his ability, then I'm confident about it." Careful there. It's always possible that Smith takes the rhetorical words "he can miss 100 shots" as a literal invitation to miss 100 shots. Jokes aside, Blatt must give serious thought to shaking things up. Smith proved in Game 1 of the East finals against the Hawks that he can be a positive difference-maker, hitting eight threes, but that performance feels like a lifetime ago. Against the Warriors, Smith is a team-worst minus-48 in 132 minutes, and he's averaging just nine points even though he's taken more shots than anyone except James. "I can't play no worse," Smith said Saturday. It's hard to argue. Things have reached the point that where "Can Player X really be any worse than Smith?" is a valid question. Blatt's options are as follows: he can start Smith for Shumpert, he can start Smith for Dellavedova, he can start Smith for Mozgov, he can leave his starting lineup and rotation untouched, or he can cut Smith's role considerably. If Blatt starts Smith for Shumpert, the goal would be to get Smith's confidence going early by playing him with James, and then sticking with a fairly standard minutes distribution. If Blatt starts Smith for Dellavedova, the goal would be to load up on perimeter versatility to counter Golden State's smaller look, while also hoping to get Smith going early. If Blatt starts Smith for Mozgov, he would be going all-in on matching small with small, hoping that the free-flowing nature of the game would appeal to Smith's improvisational skills. If Blatt leaves his starting lineup and rotation as is, he is basically just praying that the fifth time will be a charm and that Smith will show up. If Blatt decides to cut Smith's role, he will need to turn to Jones and/or Miller to pick up the minutes. None of those options looks overwhelmingly tasty, although there's good reason to fear that the status quo will continue to produce poor results. Starting Smith over Shumpert would be the least radical play, and it's definitely worth considering. That said, if Smith doesn't show marked improvement early in Game 5, Blatt should seriously consider moving on to Jones and/or Miller. Smith's recent play just hasn't warranted a long leash, or even a leash of standard length.